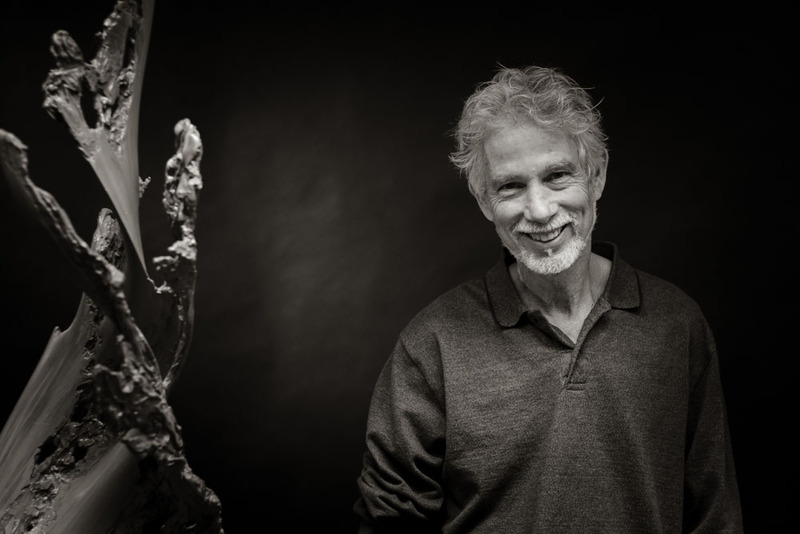 Ron Jermyn is an elemental sculptor, whose works of tremendous force, power, and serenity are conjured from a primeval environment of Fire, Air, Water, Earth. A lover of the open spaces and of the ocean, Jermyn is also something of an environmentalist, whose works invite us to meditate on the simple icons of Torrey Pine, wave, cyclone, water spout, etc. As such, his works allude to Zen artistic practice, in which the artist subdues the presence of his own ego and creative hand, to allow the viewer and the work themselves to become one — aesthetic contemplation and exchange, as yin-and-yang unity. The artist works in a variety of media, including lost-wax bronze casting. However, instead of beginning only with clay models and wax replicas to form his moulds, Jermyn also pursues the unusual practice of hand-hammering stainless steel rods into final forms. These may then be marketed as one-of-a-kind unique sculptures, or become the model from which bronze casts are thereafter fashioned. Finally, the artist sometimes works in one-of-a-kind plasters, appreciating the ‘foamy’ whiteness of the medium to capture wave imagery, among others.